After playing tight end, defensive tackle, and inside linebacker in college, Bickett moved to outside linebacker as a senior and was Defensive Player of the Year in the Pac-10, amassing 151 tackles and six sacks. He was chosen by the Colts in the first round of the 1985 NFL draft (fifth overall). Despite a contract holdout that delayed his reporting to training camp, Bickett moved directly into the starting lineup at right outside linebacker. He went on to lead the team in sacks and rank third in tackles. Bickett followed up his fine rookie year by being a Pro Bowl alternate in 1986 and made it to the Pro Bowl in ’87, a year in which he had eight sacks, 113 tackles, and also was a second-team choice (AP, NEA) and first-team All-AFC selection (UPI, Pro Football Weekly). 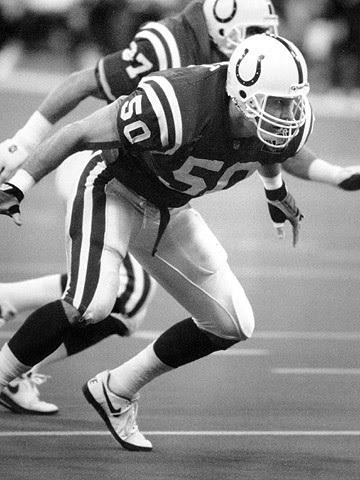 Bickett was a second-team All-AFC honoree by UPI in 1988, and while he never again received Pro Bowl or All-league or conference honors, he remained a solid player for the Colts for nine years. He accumulated 50 sacks, 9 interceptions, and was credited with 1052 tackles before moving on to Seattle for two years in 1994 and ’95 and finishing up with Carolina in 1996.